Station affiliations change, with GTV9 now aligned with TCN9 Sydney, and HSV7 now aligned with ATN7 Sydney. 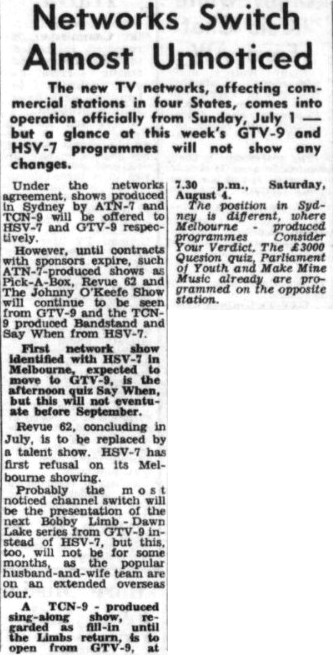 The change would see the formation of what is now the Seven Network and the Nine Network and would result in some programs swapping channels to match the new alignments. The Age notes, however, that Melbourne viewers will notice few on-air changes for some weeks, even months, as sponsorship contracts will be left to run their course before specific programs change channels.